This delicious dessert looks impressive but is simple to make. French for 'a thousand leaves', mille-feuille is made from layers of crisp flaky pastry filled with nuts, cream and alcohol-soaked clementines. Place the clementine segments in a bowl, pour the liqueur over the top and leave to soak for at least 30 minutes. Place the pastry on a baking sheet and brush with the egg, prick with a fork, then scatter half the nuts over the top. Bake in a preheated oven 220°C, gas mark 7 for 10 minutes until risen and golden and allow to cool. Cut into 3 equal strips. To assemble the mille-feuille, whip the double cream and sugar together until fairly stiff then fold in the remaining nuts. Place the bottom layer of pastry on a plate, cover with half the cream and half the clementines. Repeat using the remaining cream and clementines, finishing with a layer of pastry. Dust with icing sugar and decorate with a sprig of mint and serve in slices. 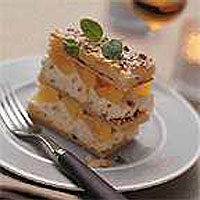 To prevent the pastry from becoming soft, assemble the mille-feuille no more than an hour before you wish to serve it. To make a Greek-style baklava, layer sheets of buttered filo pastry, with a mixture of ground mixed nuts, cinnamon, sugar and clementines. Bake in a preheated oven 180°C, gas mark 4 for approximately 40 minutes or until golden, then pour warm honey and clementine juice over the top and allow to cool before cutting into squares.